SteriGuard™ Anti-Microbial Cord Drops provide excellent protection against the growth of microbes on all surfaces. Independent testing proves the ability of these devices to inhibit the growth of Escherichia coli, Gram (-) and Staphylococcus aureus, Gram (+) providing long lasting benefits to manufacturers’ beyond conventional cleaning methods. Factory assembled, custom solution Cord Drops manufactured using heavy-duty SEOW/STOW cord for maximum durability and longevity meet the most demanding industrial and construction applications. SteriGuard provides a cost-effective way to add additional safety precautions and unequaled assurance that every feasible step has been taken in the interest of consumer protection. 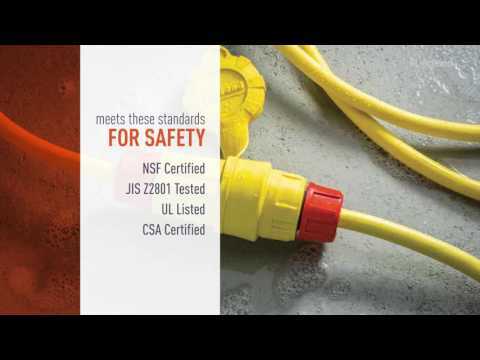 The SteriGuard™ Anti-Microbial Cord Drops with Steriguard™ Anti-Microbial plugs and connectors are a complete anti-microbial solution. To ensure you get the right product for your application, use the charts and follow the example below to select the right cord size and type, your required length, and the device part number. To place the order contact Customer Service at 800-223-4162 or customer.support@legrand.us. Prefix Cord Size and Type Select Length SteriGuard Part No. above is an example only.